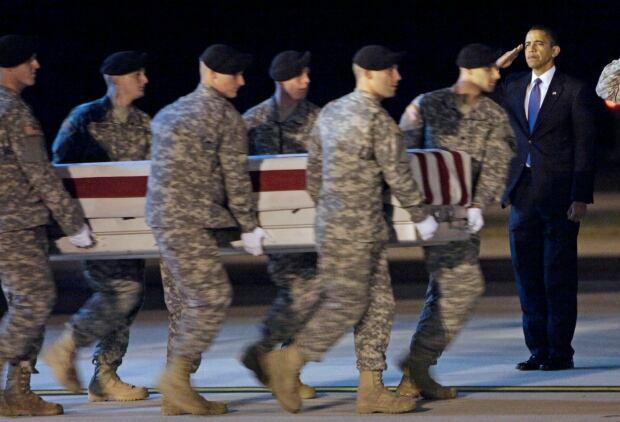 U.S. President Donald Trump on Tuesday will call the families of four soldiers killed this month in Niger, the White House says, as Trump again casts doubt on whether his predecessor appropriately consoled the families of military personnel who died in war. Trump suggested Tuesday that in 2010 President Barack Obama did not call John Kelly, a former marine general who is now White House chief of staff, when his son, marine 2nd Lt. Robert Kelly, was killed in Afghanistan. A White House official later said that Obama did not call Kelly, but did not immediately respond to questions about whether the former president reached out in some other fashion. In fact, White House visitor records show Kelly attended a breakfast Obama hosted for Gold Star families six months after his son died. A person familiar with the breakfast — speaking on condition of anonymity because the event was private — said the Kelly family sat at Michelle Obama’s table. The record is plain that presidents reached out to families of the dead and to the wounded, often with their presence as well as by letter and phone. The path to Walter Reed National Military Medical Center and other military hospitals, as well as to the Dover Air Force Base in Delaware, where the remains of fallen soldiers are often brought, was a familiar one to Obama, George W. Bush and others. Bush, even at the height of two wars, “wrote all the families of the fallen,” said Freddy Ford, spokesperson for the former president. Ford said Bush also called or met “hundreds, if not thousands” of family members of the war dead. Judy Parker lost a son, army Specialist William Evans, 22, in a roadside bomb in Iraq in 2005 and said the first time she saw her younger son cry over his brother’s death was in Bush’s arms. The soldier was from Hallstead, Pa. Bush came to the Fort Indiantown Gap Army post in northeastern Pennsylvania shortly after her son’s death, to meet her family and the families of the other guard members killed that month. The White House said letters would go out and calls would be made to the families of the slain soldiers in Niger on Tuesday. The family of Staff Sgt. Dustin Wright, one of the soldiers, was told by an army casualty assistance officer to expect a phone call from Trump by Tuesday evening, said Will Wright, the soldier’s brother. The soldier’s family in rural southeast Georgia has received “immeasurable support from the administration” and the military since he was killed Oct. 4, Will Wright said. He added that it would be “a great honour” to hear from Trump personally. Trump addressed the matter when asked why he had not spoken about the four soldiers killed in Niger. They died when militants thought to be affiliated with ISIS ambushed them while they were patrolling in unarmoured trucks with Nigerien troops. “I actually wrote letters individually to the soldiers we’re talking about, and they’re going to be going out either today or tomorrow,” he said, meaning he wrote to the families of the fallen soldiers. Bush’s commitment to writing to all military families of the dead and to reaching out by phone or meeting with many others came despite the size of the task. In the Iraq war alone, U.S. combat deaths were highest during his presidency, exceeding 800 each year from 2004 through 2007. Bush once said he felt the appropriate way to show his respect was to meet family members in private. Obama declared an end to combat operations in Iraq in August 2010, and the last U.S. troops were withdrawn in December 2011. As Obama wound down that war, he sent tens of thousands more troops into Afghanistan in 2009 and 2010, and the death count mounted. From a total of 155 Americans killed in Afghanistan in 2008, which was Bush’s last full year in office, the number jumped to 311 in 2009 and peaked the next year at 498. In all, more than 1,700 died in Afghanistan on Obama’s watch. Trump visited Dover early in his presidency, going in February with his daughter Ivanka for the return of the remains of a U.S. Navy SEAL killed during a raid in Yemen, William (Ryan) Owens. “No doubt in my mind that President Obama suffered when people died on his watch,” he said.